It looks like a UDRP was filed against another dictionary .com domain name at the National Arbitration Forum. Novelist.com is currently the subject of a UDRP filing, and it is NAF case #1722095. Novelist.com is owned by WebMagic Ventures, LLC, a company that owns and uses a large portfolio of descriptive and dictionary domain names. Novelist.com was created nearly 20 years ago, in December of 1997. The oldest historical Whois record, according to the DomainTools Whois History Tool, is from 2004. At that time, the domain name was also owned by this company. It is quite possible that the company owned this domain name even prior to this, perhaps even since it was created. In my opinion, WebMagic has one of the top portfolios of keyword .com domain names. Among some of the company’s top domain names (listed on its website) include Abuse.com, BeverlyHills.com, Jackpots.com, Korean.com, Pilots.com, Visas.com, and many others. I was curious if the company ever faced a UDRP considering the quality and generic nature of its domain names. Using UDRPSearch.com, I was able to see 3 prior UDRP filings. WebMagic won each of these cases (Ace.com, Ace.us, and DataMiner.com). When it comes to a dictionary .com domain name such as Novelist.com, there could be many entities that think they have a right to the domain name. As with all UDRP proceedings, the complainant will need to prove the domain name was registered and is being used in bad faith (among other important aspects). Given the age and usage of the domain name combined with the fact that it is a fairly common word .com domain name, it seems like this will be very challenging to say the least. Like I do with most valuable domain names that are subject of a UDRP proceeding, I will be following the case. 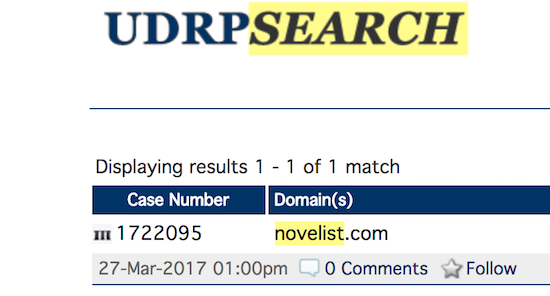 Update: Novelist.com UDRP has been decided in favor of the domain owner. Read about the Novelist.com decision.